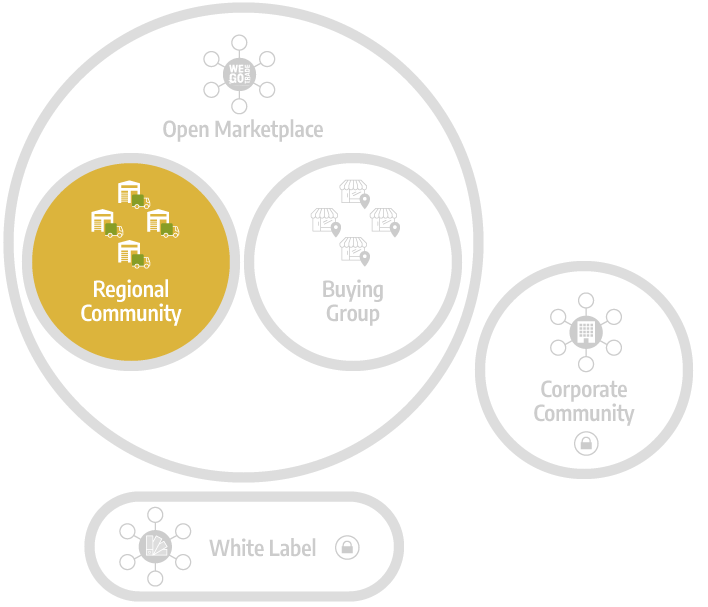 A Regional Community allows businesses of a particular region or from a common industry to optimize, promote and facilitate trades between their members on the Open Marketplace. The Regional Community gives their vendors more exposure, and makes it easier for their retailers to find the right products. Related brands, companies located in the same region or offering similar products, suppliers that have a certain accreditation or certification, can all benefit from creating or joining a Regional Community. Members could also decide to build one to focus on a particular industry. In either case, the idea is to group many members under a common theme and facilitate their business. Many vendors and many retailers make up a Regional Community. They all share a common interest in doing business together. But vendors and retailers interested in one particular type of product will also benefit from creating a Regional Community. For example, a group of independent microbreweries could decide to create a WEGOTRADE community. They would offer all their products to potential retailers. Each microbrewery would be aided by the notoriety of the other and become exposed to retailers interested in buying similar products. The vendors all benefit from a greater exposure, multiplying trade opportunities. On the other hand, retailers may be interested in joining a Regional Community. They can then discover products of a certain type or from a particular region, all under the same roof. WEGOTRADE will facilitate the entire process and make everyone’s business easier.